What should you consider when buying a thermal imager? First of all, a solid quality product should be considered. What good is a great sensor resolution and many additional functions, if the device already shows deficiencies after the unpacking? The temptation is often large, especially for the beginner and private user, to buy cheap far east products to seemingly save a lot of money. But these manufacturers often try to enter the established thermal imaging market with a low price and often save on the quality. Of course, you should pay attention to how much money you want to spend, but well-known brand manufacturers usually deliver reliable quality and often good support if problems occur. If you intend to use the device only sporadically for a project and then want to have it ready at hand, the choice of a no-name manufacturer can save a lot of money. An important point to consider when buying a thermal imaging camera is the resolution of the infrared sensor of the device. In combination with the FOV (Field of View), a too low resolution often limits the application. If you have a relatively large field of view and low resolution, you should be aware of the fact that a exterior façade of a house can be difficult to examine as details will not be visible. On the other hand, if, for example, an electronic circuit is to be examined, a thermal imaging camera with low resolution and narrow FOV can already be sufficient because the measurement object itself is small. 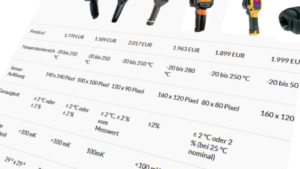 Note that the price of a thermal imager depends strongly on its sensor resolution, but that, as mentioned above, one also limits oneself with a low resolution to certain areas of application. Often, only after acquiring a device there are further thermal issues and it would be a pity if the performance of the new device would not be sufficient. Consider whether a more powerful device would be worth it. As the most important property that beginners and beginners should observe in thermography is a simple handling and operation of the device. Often manufacturers advertise with many additional functions and adjustment possibilities. On the one hand, the beginner may be overwhelmed, and the training time will be unnecessarily lengthened. On the other hand, only a few core functionalities of a thermal imaging camera are often decisive for a correct application. In any case, you should pay attention to whether an integrated digital camera and a laser is required for easier targeting, as this can considerably speed up the work at frequent use. Also, the thermal imaging camera should not be overloaded with too many buttons, as this can not only be detrimental to large hands, but can also often lead to frustrating confusion in practice. If you have already worked with a certain model of a manufacturer for years, and if you are used to the operation, you should be aware that switching to another manufacturer often involves a habituation phase. 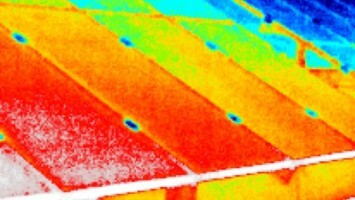 Look for useful additional features when buying a thermal imager! As an electrical installer or heating technician, it is important to check that the thermal imaging camera is equipped with an integrated digital camera and preferably a so-called image-combining display. This makes the diagnosis process considerably easier and can also be valuable when documenting damage. When examining an external facade, these functions are not necessarily decisive for purchasing – but perhaps the possibility of defining a measuring surface where the average, maximum and minimum values are calculated. The flip side of many built-in features is, as mentioned, an increased effort and a difficult entry for beginners who may not have as much technical background knowledge. 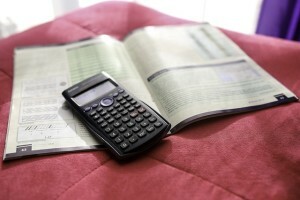 Not infrequently, manufacturers often demand considerable additional costs for seemingly simple additional functions. Therefore, you should finally consider which specific functions of a thermal imaging camera are really needed for the intended applications.